Hello! | Forum Authority Hello! I've seen Forum Authority some months ago, but finally, today I finally got the guts to register on this forum! From what I've seen, this is quite a nice forum, with a simple user interface. Anyways, sorry for being rude! I feel mad at myself because I consider myself to be kind and helpful. My name's Eqilux, and I come from the UK, in a small town, living in front of my desk. 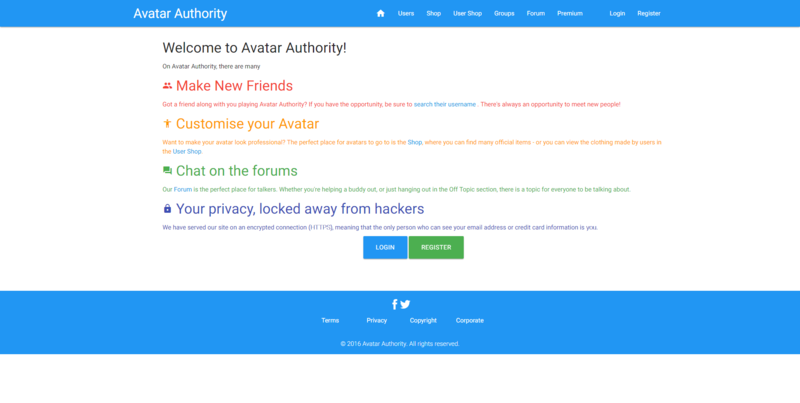 I own a company called Eqilux Networks, Inc. and I'm CEO of a game similar to ROBLOX called Avatar Authority (inspired by Forum Authority). I hope to find this forum useful in the future, but I won't be as active because the teachers are piling my bags with tons of books. As always, see you in the next post. Welcome to Forum Authority enjoy your stay and have fun. (12-20-2016, 07:04 AM)Eqilux Wrote: I've seen Forum Authority some months ago, but finally, today I finally got the guts to register on this forum! From what I've seen, this is quite a nice forum, with a simple user interface. Hey there! I'm happy to see you have decided to join, we are a relaxed and friendly community, so please make yourself at home. If you need anything don't hesitate to private message myself or another member of staff. Quote: CEO of a game similar to ROBLOX called Avatar Authority (inspired by Forum Authority). Wow, now that's amazing to hear. This looks superb! I wish you the best of luck with the project. @Eqilux It looks great! Best of luck with it.